Zipcar, recently acquired by Avis, offers “wheels when you want them.” Photo courtesy of Zipcar. Zipcar’s $500 million acquisition by Avis-Budget Group announced last Wednesday is a watershed moment for the car sharing industry. What will it mean for car sharing? Clayton Lane is COO of EMBARQ, the WRI Center for Sustainable Transport, and helps lead WRI’s global Cities initiative, focused on energy, water, and transport. In 2002, Clayton co-founded PhillyCarShare in Philadelphia. Barely ten years ago, no one knew whether car sharing could even work in North America, let alone become a staple of trendy and pragmatic urban living. Yet today Zipcar, plus dozens of innovative start-ups like City CarShare, PhillyCarShare, I-Go, and CommunAuto, have grown into robust community assets in every major U.S. and Canadian city. Car sharing has made an indelible mark on how we live in cities. Membership exceeds one in five adults in many urban neighborhoods from Montreal to San Francisco. Each shared vehicle in North America has been shown to replace 9 to 13 personal cars, and reduce driving by an average of 44% – as members pocket the savings and choose to walk, bike, and take transit. Zipcar has been at the forefront of this transformation. Launching in Cambridge, Massachusetts, with a handful of lime-green Volkswagen Beetles, the feisty start-up pioneered early innovation, catalyzed massive scale-up around the world, and helped inspire a whole movement toward shared access to everything from houses, to bicycles, to parking spaces, and even pets. Given the counter-cultural success of car sharing, what should we make of Zipcar’s acquisition by a staple of the auto industry? Is Zipcar’s purchase by the “big guys” the greatest success of car sharing, or its ultimate failure in the “real world” of grown up companies and mainstream culture? Will synergies with Avis lead to game-changing innovations – the type that propelled Zipcar to trend-setting stardom – or spell the end for car sharing? The truth is that Zipcar took its foot off the innovation pedal long ago, in favor of its race for scale and elusive profitability. While Zipcar has innovated at the margin – recently introducing moving vans, a new mobile app, some electric vehicles – it is no longer the world-changing role model that defines the cutting edge of “what could be”. Although Zipcar’s 760,000 members account impressively for nearly half of global car-sharing members, the company has never turned an annual profit since its founding in 2000. After a successful IPO in April 2011 – another watershed moment – Zipcar’s stock initially rose to $31.50 but tumbled after continued losses, closing at just $8.24 before the Avis announcement. Zipcar had only two month’s operating cash on hand as of its September 2012 close. The Avis acquisition, rather than curtail innovation, might provide a soft landing that allows Zipcar to think big again. The Avis deal should offer improved convenience to Zipcar members, who will gain access to Avis’s massive fleet on weekends, when Zipcar is usually short of cars and Avis short on customers. And Zipcar should enjoy significant savings on insurance and fleet purchases, altogether promising better financial sustainability. 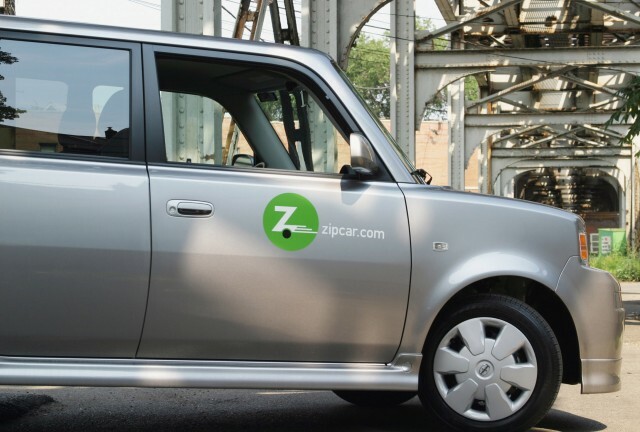 Zipcar will continue, becoming the largest and latest brand owned by Big Rental – alongside Hertz Connect, DriveNow (Sixt), and WeCar and PhillyCarShare (both Enterprise). The establishment’s foray into car sharing is a response to its successful mainstreaming – and a sign that large-scale innovation has moved on. But the most exciting news in car sharing is not in the paper. It is on the street. Social entrepreneurs are redefining how we think about the car and how we share it, though one-way services, spontaneous access (no reservations), and more. Two advancements will revolutionize car sharing: peer-to-peer service, and innovations for developing countries. Peer-to-peer (P2P) services allow individuals to share their personal cars directly with others. Imagine convenient, hourly access to virtually every car parked on-street. Most cars sit idle 95% of the time. P2P allows us to access that vast unused capacity, and enables car owners to earn money by driving less – a win for the environment. P2P also eliminates the huge capital required for car sharing fleet expansion, enabling scale-up like never before. The UK’s Whipcar, for example, grew to 19,000 vehicles in two short years, nearly doubling Zipcar’s global fleet, with just a tiny fraction as much capital. San Francisco, a hotbed of innovation, hosted five P2P start-ups in 2012. RelayRides launched in 2010 and already serves 13 U.S. cities with several dozen car models, usually priced lower than Zipcar and traditional rentals. The future of innovation is decidedly not corporate. It is collaborative, participative, and co-created. Social entrepreneurs are also paving the way in Asia, Africa, and Latin America – home to 74% of the world’s urban population but only 4.5% of its car sharing members. Cities of India and China alone are expected to add 700 million new residents by 2030, most aspiring to join the burgeoning middle class. Will these cities sprawl with polluting cars? New start-ups have launched recently in São Paulo, Beijing, Hangzhou, Istanbul, and Mexico City. They are experimenting to serve diverse cultures and address unique challenges of developing countries – like vehicle restrictions in Beijing, three-hour traffic jams in São Paulo, and paltry on-street parking in Mumbai. They are educating governments, establishing an industry of suppliers, and building new markets. These are the big stories of car sharing. Avis’s acquisition might very well enable Zipcar to return to greater innovation, scale, and quality. Let us hope it does. Regardless, entrepreneurs are redefining our relationship with the car, on the streets of San Francisco and São Paulo. This is the enduring success of car sharing.